DeadCat VMPR Artificial Fur Wind Shield is rated 4.8 out of 5 by 14. Rated 5 out of 5 by Ryan from more of a need than a want If you have a Rode VideoMic Pro this is more of a need than a want. Over the weekend I used mine for the first time and this saved me. I didn't think it was super windy, but it was just enough wind to move the microphone around causing bad audio. I immediately put this on and it did a excellent job or reducing the wind noise. Rated 5 out of 5 by Chris from Needed for shooting outside This deadcat makes a significant difference when you're recording audio outside. It goes on easily and fits the Rode VideoMic Pro perfectly. You may need to take it off when changing the battery, but it's not an inconvenience. You also still have access to back controls, so the deadcat doesn't hinder those functions. Rated 5 out of 5 by SauteeLive from I Always Use This I have watched too many videos online that have that irritating sound of wind buffeting the mic. I own 3 Rode mics and they are always wearing their DeadCats (or DeadKitten in the case of my stereo mic) whether I'm outside or inside. It doesn't seem to affect the sound negatively or impede the dB levels from far away. Rated 5 out of 5 by George from Great Product Absolutely Necessary Great product and absolutely necessary for anyone's shooting outside. It was a great addition to my rode video mic pro and really helped cut out all wind. Better than most others in terms of quality. Rated 5 out of 5 by Anonymous from Highly Recommended. Other than it's a little hard to pull over the end of the mic I'm very happy with it. Works quite well to combat wind noise. Rated 4 out of 5 by Juan Sebastian from Does it's job, but covers the switches Everytime I have to turn on or off the mic, I have to stretch the deadcat so I can access the switches which I don't think is good in the long term for it's integrity. In term of reducing noise caused by wind, it works really well. Installation is weird and I had to watch some YouTube video to be able to do it. Rated 5 out of 5 by David M from Serves it's only function well What else can be said? It does what it's supposed to. Don't think it can really be done any better or any different. I'm pretty sure any other company would make this type of thing exactly the same. Rated 5 out of 5 by petzl47711 from Outstanding option for cutting out wind noise! This is outstanding at cutting down wind noise! I have found it invaluable when you are in a situation that requires an additional wind screen beyond what is available on the VMP. 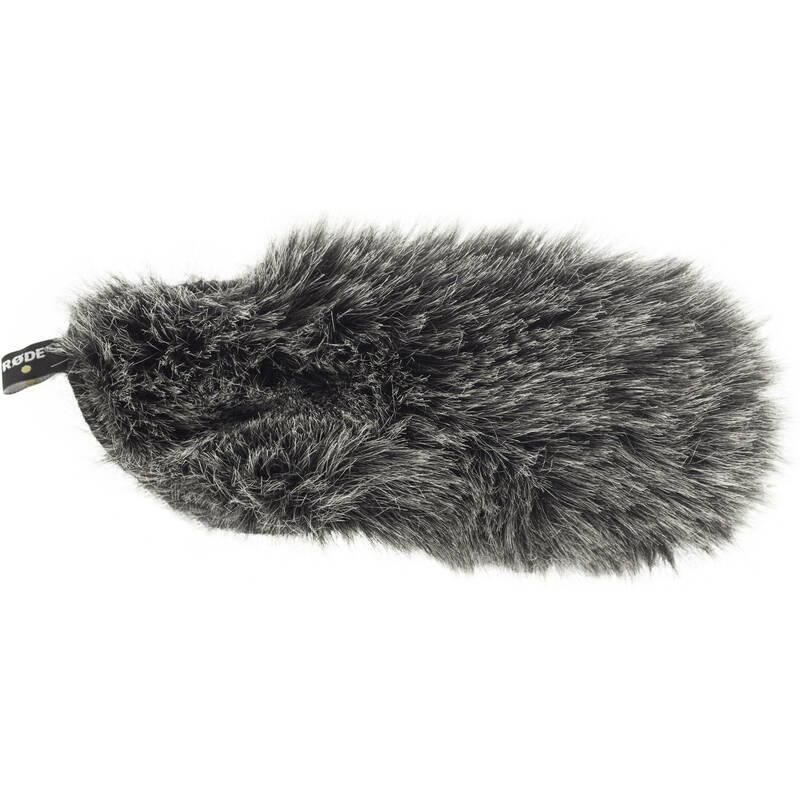 Does this fit the standard videomic (not pro) with rycote lyre suspension? This windscreen will not fit the Rode VideoMic. The appropriate item is the Rode Dead Cat Wind Muff for VideoMic, NTG1 and NTG2 Microphones, B&amp;H # RODC. Could this be completely wrapped around a Tascam DR-40? Unfortunately not. The opening on the Rode DEADCAT VMPR is too small to fit around the Tascam Dr-40. For heavy wind protection, please consider B&amp;H # TAWS11. Will this work with Rode VideoMic Pro Plus? No.According to Rode's website this is designed to work with the Rode VideoMic Pro. Not the Pro + (or Plus) unit. The Rode website does not have a Rode compatible deadcat for the Pro Plus unit. Answered by: Katherine A G.
Will this fit the new Videomic Pro Plus? No, it is too short for one thing.